TONE Scaffolding can handle any logistics requirement due to a strong network of yard facilities and a comprehensive fleet of vehicles. In the event of an Emergency Call Out, TONE operatives can be in the yard within 15 minutes to load lorries with equipment, 24 hours a day. 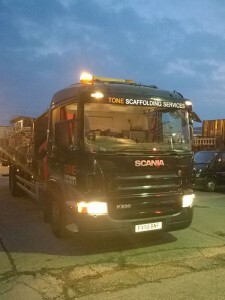 TONE Scaffolding’s fleet of vehicles is maintained to the highest standard, enabling materials and equipment to be moved quickly, efficiently and safely. The current fleet includes a range of lorry sizes from a ‘half back’, to units with 40’ trailers; many of which are fitted with integral lifting cranes. In addition any of the following can be provided: counterbalance forklift, telescopic forklift, beaver tail trailer, minibus and generator. All TONE Drivers and Yard Operatives receive thorough and up to date training. Toolbox tools are held fortnightly to highlight key issues such as PPE etc. All of the Yard Operatives hold CSCS cards Construction Skills Certification Scheme , HIAB licenses, PTS Personal Track Safety and LUCAS cards London Undergound Combined Access System .